In this terrifying tale of humanity’s desperate stand against a robot uprising, Daniel H. Wilson has written the most entertaining sci-fi thriller in years. Not far into our future, the dazzling technology that runs our world turns against us. Controlled by a childlike—yet massively powerful—artificial intelligence known as Archos, the global network of machines on which our world has grown dependent suddenly becomes an implacable, deadly foe. At Zero Hour—the moment the robots attack—the human race is almost annihilated, but as its scattered remnants regroup, humanity for the first time unites in a determined effort to fight back. This is the oral history of that conflict, told by an international cast of survivors who experienced this long and bloody confrontation with the machines. 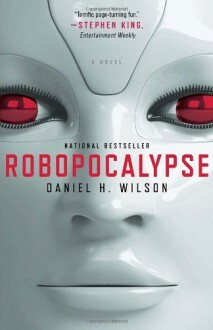 Brilliantly conceived and amazingly detailed, Robopocalypse is an action-packed epic with chilling implications about the real technology that surrounds us. I really enjoyed this one. Lots of action, lots of drama. It's probably a little too much for some but I loved it. If it's done right this will be a spectacular movie.